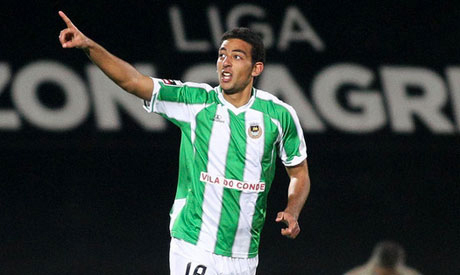 Egypt and Rio Ave striker Ahmed Hassan 'Kouka' believes that those who supported him this season are the secret behind his success in Portugal. Koka scored for the second straight game in Sunday's 1-1 league draw with Moreirense to move second in the top scorers chart of the Portuguese league. The 21-year-old, who also scored in Rio Ave's 1-1 draw with Boavista last week, took his tally to 11 league goals, five short of top scorer Jackson Martinez of Colombia. Kouka who scored another three goals for Rio Ave this season said via his Twitter account on Tuesday: "14 goals so far this season. Thank you very much to the fans and to everyone who has supported me...you are the main reason for my success." Rio Ave currently lie seventh in the Portuguese league table with 29 points, 24 behind leaders Benfica.